Set in the far west of the Algarve, the beautiful fishing village of Burgau is an ideal location for a relaxing holiday. Only minutes away are 2 local beaches both an expanse of golden sand. Users of the apartment will have access to the pool. Within walking distance too are local restaurants offering fresh, delicious, mostly local, cuisine. For golfers there are numerous championship standard courses locally, the nearest, a 5 minutes drive. The town of Luz and the historic town Lagos are only minutes drive away. The apartment itself consists of 2 bedrooms, (1 double and 1 twin). The double room has an en-suite bathroom with shower and whirlpool bath and underfloor heating. The house shower room also has underfloor heating. The kitchen comes with all modern appliances, including washing machine and dishwasher. The internet, TV and DVD player are also available. A large balcony with patio sofa and chair & dining table & chairs leads off from the sitting room and main bedroom. En-suite bathroom to bedroom 1 with toilet, sink, bidet, whirlpool bath, shower (over bath). Bathroom 2 - toilet, sink, shower. Lounge with cream leather corner sofa, coffee table TV & DVD. Extending dining table and leather chairs. Bookshelf with games and books. Cooker, hob, fridge, freezer, washing machine, dishwasher, microwave, kettle, toaster. 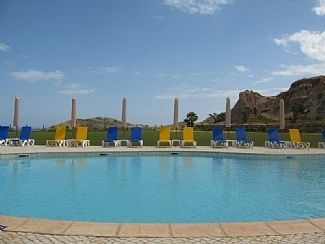 Nearest golf course - Boa Vista Golf and Parque Da Floresta. We had a nice stay at this apartment. It’s in a nice quiet location. It was easy to communicate with the owner and the lady who met us on arrival was very helpful. Lovely apartment and great facilities. Would have been 5* if TV had been ok.
Once this is fixed and Sky is available will defiantly be 5*. Tv did not work towels were not big enough and only changed once a week as was the cleaning and bed change . I am sorry the apartment was not what was expected. I did not know the TV was not working, as I live in the UK I rely on my property manager to let me know if there is an issue...these matters are usually dealt with immediately. The guest before or after you have not had an issue?? A cot is available for hire - cost 20 EURO payable locally. Welcome Packs are available - cost 15 EURO payable locally. One clean & linen change is included in price - extra cleaning and laundry is payable locally"
In over 10 years of letting the apartment this is the first complaint we have received regarding towel size - however, I take your comments on board and will review with the property manager. I hope these issues did not affect your stay and you enjoyed your holiday in Burgau! Wonderful apartment close to the beach! We had a wonderful week in Burgau. The apartment is really well located and is a great base to tour the local area and is no more than 40 minutes from all the hot surf spots! The apartment is of a high standard and features everything needed to relax at the end of the day; the dishwasher, internet TV and large balcony (to dry wetsuits) made life easy. We're planning another trip in October and will be planning to stay in Chris' apartment again! Thank You for your response and we are glad you enjoyed your stay in Burgau. Everything went really well, excelent welcome, super clean, perfect location! Appartement spacieux, propre et très bien placé. Nous avons passé de très bonnes vacances à Burgau, adorable petit village au bord de l'océan. L'appartement conforme à la description, bien situé et bien équipé. Nous avons hate d'y retourner pour un nouveau séjour! Would be of interest to walkers, runners and cyclists as thre are a number of beautiful coastal walks and specific biking tracks/routes. 5 minute walk down a steep road to Burgau beach. Large and sandy (golden sand). 15 minute walk to next beach along unmade road. Much larger more secluded beach. West Coast beaches and surf schools about 40 minute drive. Luz - 5 minute drive. Lagos - 10/15 minute drive. There are 2 supermarkets and a cashpoint in the village. The village has a number of restaurants, mostly serving local cuisine. Takeways are available from the local pizzerias and Indian. There are a number of local bars but no nightclubs. The nearest nightclub would be in Lagos. Changeover Day: Flexible. Notes on prices: A cot is available for hire - cost 20 EURO payable locally. Welcome Packs are available - cost 15 EURO payable locally. One clean & linen change is included in price for bookings over 10 days - extra cleaning and laundry is payable locally.